Differentiating between the 13 species of otter and the two species of mink is fairly straightforward in the wild, as you can narrow the possibilities considerably by geographical area. Identifying captive ones might be easier, because you can get up close, but if you know what to look for you might be able to differentiate otter and mink species even at a distance. Watch the animal for as long as possible, using binoculars if you have a pair. Take photos if possible, ideally including at least one of the animal on land. Note the color, behavior, shape of the face and shape of the tail. Make a sketch if you don’t have a camera. Walk over to where you photographed the animal on land and place a small item, such as glove, on the spot and take another photo. By comparing the two photos later, and measuring the item, you can get a fairly good estimate of the animal’s length. Note the habitat. An otter-like animal swimming in a coastal area is probably a sea otter. One in or near a river or lake could be an otter or a mink. Study the tail. Both have long tails, but a mink’s is more rounded and furry, whereas an otter’s is somewhat flattened. Mink also have darker coats and, unlike otters, don’t have any webbing on the feet. The face of an otter is rather blunt; a mink's is pointy. Watch the way the animal swims. Otters are better adapted to the water than mink, and you’ll probably just see the top of an otter's head and a bit of the tail. A mink swims high in the water, giving you a view of much of his body. Refer to a field guide to determine which species are present in your area. If you are in the United States and the animal was a mink, it was almost certainly an American mink (Mustela vison). 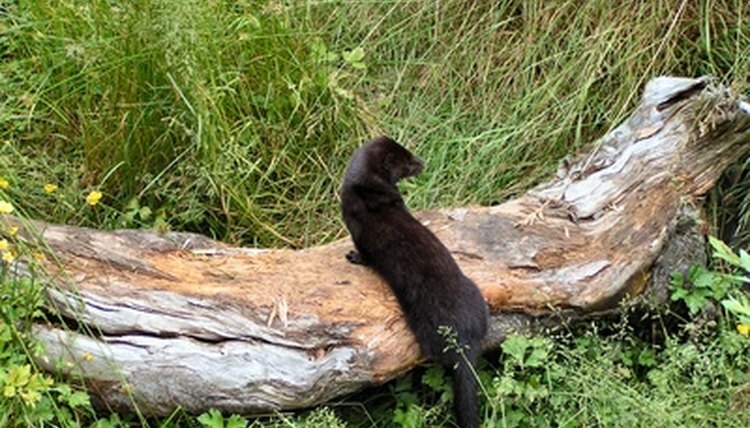 The range of the highly endangered European mink (Mustela lotreola) is limited to small patches in France, Spain, the Ukraine, Romania and Russia. If he was an otter, he could be one of two species, depending on the habitat, but he is most likely the North American river otter (Lontra canadensis). There is a small chance the otter is an African, Asian or South American species who has escaped from captivity, but this is unlikely. Compare your estimate of measurement to the possible species if the animal appears to have been an otter and you aren't sure which species of otter it was. Compare your photographs to the images in the guidebook. If you don’t get a match, consider consulting an expert such as those at a local university, zoo or museum.  Otters and mink belong to the stoat family, and some of the other species within the family look similar, especially at a distance. The crucial difference is that these other mustelids swim rarely if at all. Size is another factor. Most weasels, for example, are far smaller. If you spotted an animal that doesn’t closely resemble any of the otters in your guidebook, look through the other animals, especially if you never saw him enter the water.